I live on New York Avenue and know, first hand, how dangerous the road is (see Our View “One way only?”, September 10). COURTESY PHOTO | Shelter Island Girl Scouts and friends posed behind Independence Hall during a recent trip to Philadelphia. The site was where crowds stood in 1776 to hear the Declaration of Independence read for the first time. When you think of organizing a trip for scouts or students to Philadelphia, you naturally plan a visit to Independence Hall, the Liberty Bell and other sites in the city linked to United States history. You might not think to include the Eastern State Penitentiary. But Janine Mahoney, the Shelter Island Girl Scout coordinator, wanted to show off additional parts of the city that fifth and sixth graders hadn’t seen on an earlier Philadelphia trip. “The penitentiary seemed like a site that would interest scouts of all ages and certainly one that we had not ever visited in the past,” Ms. Mahoney said. 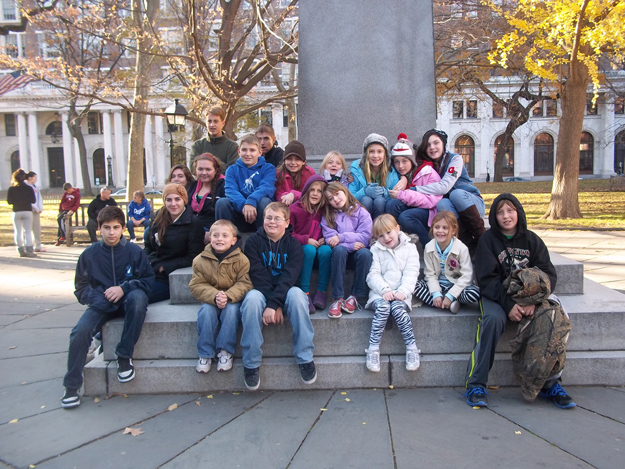 Funds from the Shelter Island Educational Foundation offset the cost of the one-day trip. The Shelter Island Presbyterian Church also contributed to the trip’s cost. “Terror Behind the Walls,” and various other special events. Al Capone was at Eastern State in 1929 and 1930 after being arrested for carrying a concealed weapon. His time there was spent in relative luxury, according to guides at the prison today. His cell on the Park Avenue Block had fine furniture, oriental rugs and a cabinet radio. Willie “It’s where the money is” Sutton was incarcerated at Eastern State for 11 years. In 1945, he and a gang of other cons made an escape attempt through a tunnel that went 100 feet underground and had been dug by inmates, only to be recaptured within minutes. He is said to have robbed more than 50 banks, made three successful escapes from prisons and spent about 30 years of his life behind bars. The reviews are in and are all raves. “I really liked the jail and how only one person escaped,” said sixth grader Owen Gibbs. “I never knew how prisons were run in the past — very enlightening!” declared 12th grader Morgan McCarthy. “Even though there were no ghosts, I really enjoyed learning about the history and seeing the cells,” said 12th grader, Alexis Gibbs.